The ski resort Myhove have tracks of different level, lightning of tracks, ski lifts, snow groomer, snow cannons, cozy restaurants, pizzerias, cafes, rental equipment, comfortable hotels. 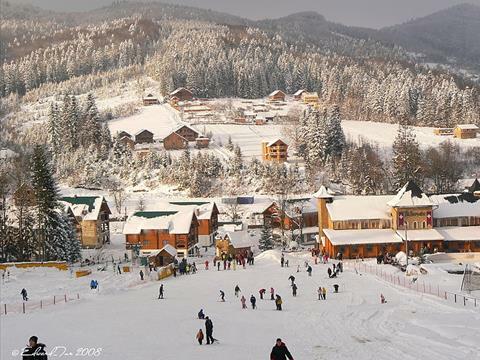 Mihovo is a ski resort in the Carpathians. This is a small village in Vyzhnytsia Raion Chernivtsi oblast. It is located among the picturesque Carpathian Mountains and has become famous by building of the modern ski resort complex on its territory. 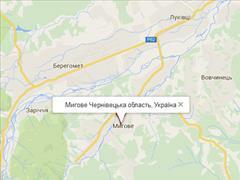 Myhove is located in 60 km from Chernivtsi city. This ski resort complex is a modern and rapidly developing complex, it becomes more popular among tourists. The ski resort is located at an altitude of 500 m above the sea level at the foot of Kychera and Stozhok Mountains. There is a convenient road to the resort. Nearby there is Solonets tract which is famous by its mineral waters. In the early of the winter it snows in Myhove and as usual there are lots of snow in December. Due to professional care of tracks and the use of snow cannons, snow cover in Myhove lasts until the end of March. The complex in Myhove operates all year. Winter holidays in Mihovo is a traditional way of spending time for skiing, snowboarding and sledding. Tracks are illuminated at nights in Myhove resort, there are rental ski equipment and there are instructors on the tracks as well. Summer holidays in the Carpathians in the complex in Migovo an feeling on horseback, bicycles and scooters, make tours around the Carpathians, ascent to the heights of the picturesque mountains. In the complex of Mihovo are working the summer outdoor pools, roledrom, complex, ropes. In summer rest in the Carpathians in Myhove complex is an opportunity of horse riding, bicycle and quads' riding as well as to make excursion through the Carpathians, to climb to the peaks of the picturesque mountains. In Myhove complex there are summer swimming pools, rollerdrom, rock climbing wall, ropes course park. Tracks in Myhove have the general length of over 3000 meters. Some tracks are laid from the top station, one of track in Myhove is built for beginners, one is for training and another is for funs of snow tubing. Track for snow tubing, length is 150 m, width is 45 m.
Tracks are illuminated, there are snow cannons and snow groomers. excursions and walking tours to mountains. evening skiing is from 200 UAH. Skis and snowboards rental are from 90 UAH. You can stay in Myhove in hotels which are near the lifts. Price per accommodation at hotels in Myhove is from 170 UAH per double room. Most of tourists come to Myhove from Chernivtsi. you have to get to Chernivtsi, then you have to take a regular bus or a taxi to Myhove. you have to drive to Chernivtsi, then to Myhove or to choose the road Kolomyia-Chernivtsi and turn to Myhove. lifts' working hours: from 9.00 till 21.00. We invite you to rest in the Carpathians in Myhove! Myhove – hotel "Khutir Solonets"
Comfortable accommodation in two-storey cottages in Myhove village in Bukovyna. Cafe, sauna, outdoor swimming pool, spa tubs, gazebo with barbecue, parking, Wi-Fi. When using materials from the site «ZymaGhory.com - resorts and holidays in the Carpathians" link placement on the portal is mandatory and this will be accepted with gratitude. We may not agree with the authors of publications opinion. We don't take a responsible for the copyright materials contents, their comments and the verity of ads.